Bryan Williams – Cancer Survivor, Heart Transplant Recipient to Marathon Swimmer! 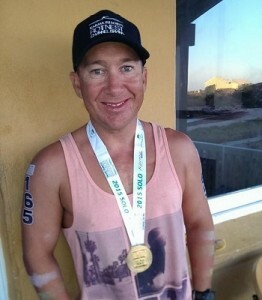 Home > News > Bryan Williams – Cancer Survivor, Heart Transplant Recipient to Marathon Swimmer! After surviving childhood cancer and a heart transplant, my donor’s heart has now enabled me to complete two marathon 20km Rottnest Channel Swim’s. This blog outlines my most recent swim, which I completed on Saturday 21st February. But first, a little background about me that brought me to where I am now. 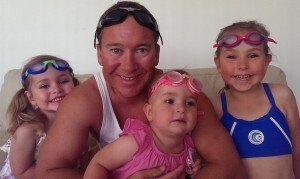 I have had to overcome adversity all my life, setting me in good stead for my latest swimming challenge. At just one year old, I was diagnosed with childhood cancer (Rhabdomyosarcoma of the abdomen). Two years of intensive chemotherapy and radiotherapy saved my life – but the treatment took its toll. At nine years old I was diagnosed with avascular necrosis (a bone disease), leading to twelve operations on my left hip during my teenage years. Twelve years later I was diagnosed with dilated cardiomyopathy (heart failure), a problem I fought for more than a decade before a heart transplant in 2005 gave me a second (or is that third) chance. I took up swimming as part of my rehabilitation after my heart transplant, and I have since competed at 5 National and 4 World Transplant Games. My hip problems culminated in requiring a total hip replacement during 2010. Since my heart transplant my wife Rachel and I have celebrated the birth of three miracle daughters, Breanna 6yrs, Summer 3yrs and Madison 21 months old, who bring us enormous joy. 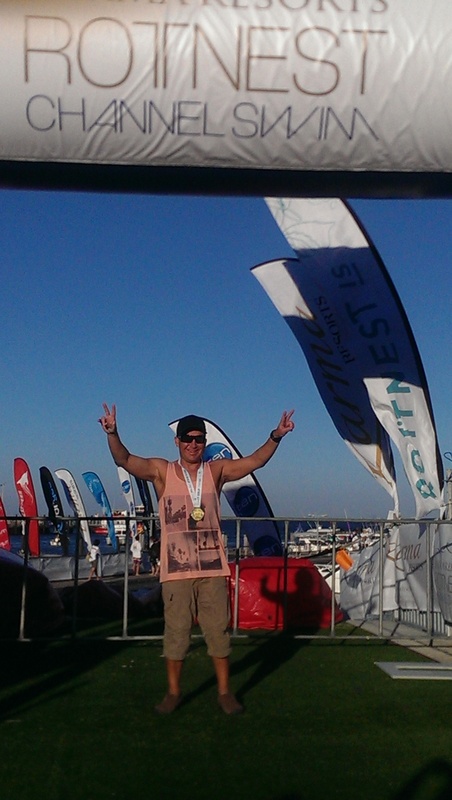 My latest challenge was to complete my second solo 20km Rottnest Channel Swim. Participants in the Rottnest Channel Swim set off from Cottesloe Beach and swim 19.7km to Thompson Bay on Rottnest Island. 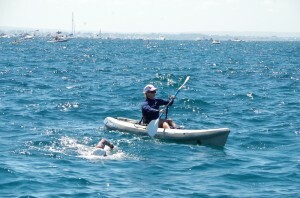 Prior to the event, I hoped to complete the swim in under 7 hours. 4:45am most mornings. I averaged about 30 km per week and I felt the strongest and fittest that I have ever been. The weather in the lead up to the event was not looking great but the channel swim has only been cancelled once in its 25 year history. Behind each swimmer is a support team to help them across the channel. I luckily had a fantastic support crew this year with my boat skipper Dave and three paddlers Nyree, Lee-Ann and Pip. Saturday morning started with an early morning wakeup at 3:30am. Last minute preparations were completed including squeezing into my race suit followed by multiple layers of suncream, anti-chafe spray and wool fat. My solo wave set off at 6:05am just as the sun was rising over beautiful Cottesloe Beach. The conditions between Cottesloe and Rottnest were terrible and very choppy, the worst for the past 8 years – basically a 20km washing machine. Unfortunately my race plan went out the window as I became very seasick from the 4km mark. I gradually got worse as the race continued and my stomach pain was indescribable. It was at this stage that a little voice in the back of my head told me that maybe I had bitten off more than I could chew, with the horrendous conditions and my sea sickness. But I told myself that stopping was not an option and therefore I had to work out a way to get through the pain for the next 6 hours. 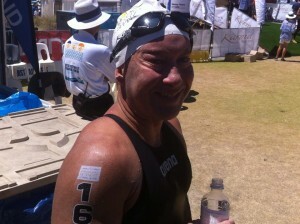 I swam on and at the 11km mark started projectile vomiting. I then continued to throw up for the whole second half of the race. Nothing was going to stop me finishing though and I broke the race down into the 30 minute drink stops and just kept swimming. By the 15 km mark I was pushing in to a strong south-westerly current which was trying to push me backwards. I had no energy at this stage as all of the vital carbs that were supposed to set me up for the second half of the race were floating somewhere in the Indian Ocean. I pushed on and managed somehow to get through the current, pass the Phillip Rock 18km marker and make it into the lee of Rottnest Island. The numbness and pain in those last few kilometres was unbelievable and my legs felt like they were dragging on the sea floor. 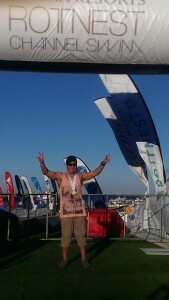 I swam the final 400m swim chute and finally touched the sand on Rottnest Island with great relief. I gingerly walked up the finishing ramp and crossed the finish line to the applause of my friends and family in the crowd. I checked my GPS watch as I crossed the line and it showed a time of 6hrs 38min and a distance of 21.46km. 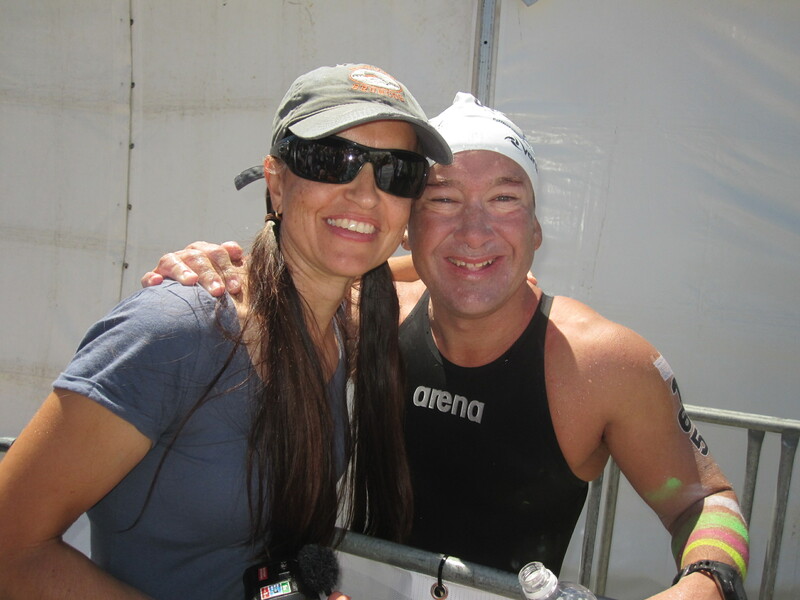 A massive thank you goes to my support team, my family and everyone who supported my swim. My biggest thank you goes to my wife Rachel for putting up with me and supporting my goals 100% and to my donor and donor family for making this possible. Thank you very much for everyone’s generous donations, for supporting my swim and helping me to highlight the importance of organ donation. I was able to use my attempt at a second solo Rottnest Channel Swim to raise awareness and over $3200 for Transplant Australia. I attribute my success and achievements in the face of adversity to a positive attitude, goal setting and perseverance. I am not one to give up when the odds are stacked against me, as evidenced by my determination to complete my Channel crossing despite the conditions and being violently seasick. I am a firm believer in that “challenges are an opportunity in disguise”. I am very thankful for my second chance at life and am living proof of the importance of organ donation, which I promote at every opportunity. I am not sure yet what my next challenge will be but I’m sure there will be many more exciting adventures ahead.